Clinton delivered her concession speech on Wednesday after Donald Trump’s victory in the presidential election. On Wednesday, Hillary Clinton addressed the public for the first time since losing the presidential election to Donald Trump. After an introduction from Tim Kaine, Clinton told supporters gathered at a hotel in New York City that she was proud of the campaign she ran. Regarding the results of the election, Clinton said that she hopes that Trump "will be a successful president for all Americans." Clinton acknowledged that the country is more divided than she thought and urged supporters to continue the work that they started. "We have seen that our nation is more deeply divided than we thought," Clinton said. "But I still believe in america, and I always will. And if you do, then we must accept this result and then look to the future." 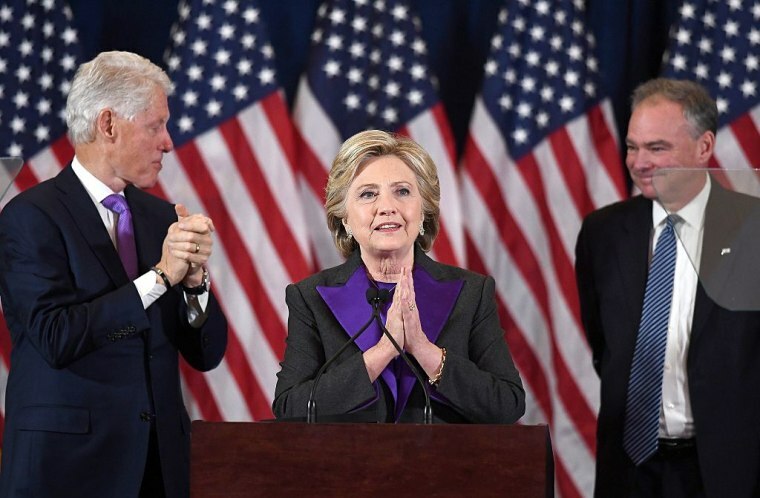 "I know we have still not shattered that highest and hardest glass ceiling but, someday, someone will, and hopefully sooner than what we might think right now," Clinton told the crowd regarding the historicity of her presidential bid. "And to all the little girls who are watching this: never doubt that you are valuable and powerful and deserving of every chance and opportunity in the world to pursue and achieve your own dreams." Clinton concluded her speech by thanking Tim Kaine, Anne Holton, Barack Obama, and Michelle Obama, and offered words of encouragement to the young people who supported her campaign. "This loss hurts, but please, never stop believing that fighting for what is right is worth it."